On the fast of Tisha B’Av this past Sunday, 300 Israelis held a demonstration and afternoon prayer service outside the Haifa Rabbinical Court to protest the arrest and questioning of prominent Israeli Conservative Rabbi Dov Hayun. Rabbi Hayun himself led the prayers, which were organized by NIF community members — The Masorti Movement, Israel Movement for Reform and Progressive Judaism, and Panim: the Israel-Judaism Network. The previous Thursday, in a dawn raid, police came to Rabbi Hayun’s home at the behest of the Haifa Chief Rabbinate and arrested him for marrying people in Jewish wedding ceremonies. After being questioned, Rabbi Hayun was released without charges. Later that day, Rabbi Hayun attended a Tisha B’Av study session as the guest of President Reuven Rivlin, who said he did not understand why the rabbi had been arrested. Israel’s Orthodox Rabbinate has a monopoly on state-recognized religious rites in Israel, including marriage. However, under the status quo, non-Orthodox rabbis have been allowed to perform marriages, despite the fact that it technically violates Israeli law. 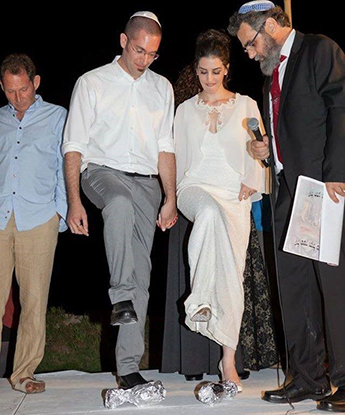 Many couples then go abroad for a civil ceremony which is fully recognized by Israel’s state institutions. Meanwhile, Israeli social media has been buzzing with posts of support for Rabbi Hayun. Many of the supporters said that they too were married in Israel in non-Rabbinate wedding ceremonies.